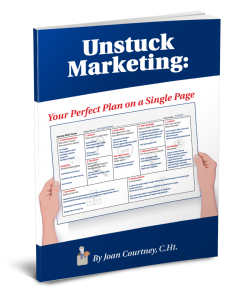 Unstuck Marketing: Your Perfect Plan on a Single Page :: Unstuck Living Pro! Love helping people through troubled times but haven’t a clue how to run a successful practice? After a few years, feel the creative well has dried up and you want to reboot? These simple techniques will invigorate your practice in one to three months. And this book will walk you through each step. This information also allows you to try out new strategies for your practice without spending a dime. Efficient. Effective. And the end result gets to the heart of your potential clients, so your phone rings off the hook. If you are the kind of person who loves helping people through troubled times but haven’t a clue about how to run a successful practice—or you feel the creative well has dried up and you want to reboot—then this book is for you. These simple techniques will invigorate your practice in 1-3 months. And, this book will walk you through each step. Rather than a 30-page marketing plan you’ll just toss in the drawer, this single page process is dynamic. It maps out your road to marketing success on a single page. Techniques for having a clear message for your business and needed action steps are presented and explored. You will have all the tools you need for success. This information allows you to try out different strategies without spending a dime. Efficient. Effective. And the end result gets to the heart of your potential clients, so your phone rings off the hook. Joan Courtney brings the best of both worlds to this book. Having a Doctorate in Business Administration, she has worked with many small businesses over the years. And for over 30 years, she has been a Hypnotherapist and Neurolinguistic Programming Practitioner. This book is designed to assist those in the helping professions to have successful practices that thrive and grow. She lives in the White Mountains of Arizona with her Canine Executive Officer, MacDuff.